Syste-mart Review 2019: Is Syste-mart a Good Hosting? 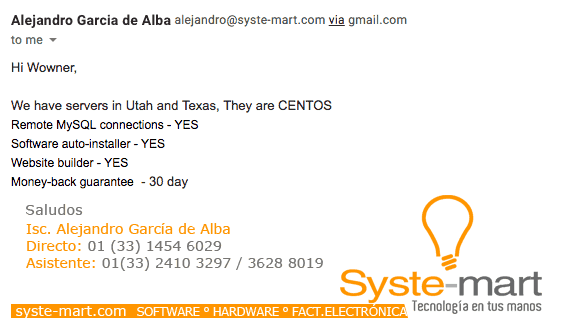 Syste-mart is a Mexican-based business that has been providing hosting services since 2004. While some of the software versions are not up to date, there’s support for advanced programming languages, a beginner-friendly website building tool, and one-click installer. Syste-mart is a Mexican-based hosting company that has been selling shared, VPS, and dedicated server packages since 2004. It has a relatively inactive Facebook page, with more than 8,000 followers. The website is available in Spanish. The plans support a fairly comprehensive range of supported software e.g., CGI-BIN, Perl, PHP 4 and 5 (not the twice as fast version 7), Python, Front Page extensions, and Server Side includes. The supported databases include MySQL, PostgreSQL, phpMyAdmin, and phpPgAdmin, so there’s all the usual features you’d expect with a shared hosting plan (albeit some using older versions). For more advanced users, you can configure Cron jobs and upon request, you can get SSH access. A little disappointingly, backups are only monthly, which seems quite risky to me. For beginners, although it’s not advertised on the website, there’s a website building tool and a one-click installer. The plans also come with a good range of e-commerce features i.e., osCommerce, CubeCart, shared SSL certificate, or an optional add-on of a paid private SSL certificate, as well as various out-of-the-box analytics tools like AWstats, Urchin5stats, Raw access logs, and a bandwidth meter. Customers of the shared hosting plan get a below par 99.8% uptime guarantee, while VPS customers get the industry standard of 99.9%. Apart from the highest-tier plan (which doesn’t included enough extra to warrant the swing in price), all of the packages are good value for money. A free .com or .com.mx domain thrown in for one year, as well as a free shared SSL certificate, are nice bonuses. You can purchase the hosting directly through the website, although the flow is a little unusual. As soon as you click on the price, you are directed in a new tab, to your PayPal account. Not a huge deal, just a bit unusual that it’s not all handled in the website. Plans can only be bought in one month terms. VAT is included and you can increase your disk space by purchasing additional GB. If you need support, there’s a basic contact page on the website with an online contact form or three local Mexican numbers you can use, as well as live chat (which was offline when I visited). It’s not clear what the business hours are, however, in my experience the response time was good. I sent an email mid-morning on a weekday and received a response on the same business day, answering my questions in full. As well as hosting, Syste-mart sells a range of local I.T. solutions, so you can be assured that the team understands technology well. The plans are good all-rounders, with all of the beginner, e-commerce, and advanced features you’d expect, only very slightly let down by older versions of some of the software. Buy fully-featured hosting with Syste-mart! Wondering how Syste-mart stacks up against other Web Hosting companies? Enter any other Web Hosting company and we will give you a side-by-side comparison.